"Erected in Memory of Joseph Orono Catholic Indian Chief By The Knights of Columbus 1911"
winter’s been keeping us off our bicycles so now we walk by this monument every morning on our way to work. a top its pedestal, the granite peak stands about sixteen feet high. we find it a disturbing monument. it celebrates joseph orono for embracing catholicism – a religion that did so much to damage native american peoples. from the beginning of european trespass in america, catholicism has contributed to colonizing, abuse and oppression of indigenous tribes. a catholic church was placed on indian island in the 1600s, native youth were sent to boarding schools where they were severely abused and told their language, spirituality and way of life was wrong. treacherous acts of inhumanity were committed against native people in the name of catholicism. columbus was no knight, he was a mass murderer. wabanaki people were born to be the caretakers of maine lands—and we need to honor them for it. the town of orono should showcase and celebrate works by living wabanaki artists. we propose that there be riverside statues commemorating native american leaders and their achievements. 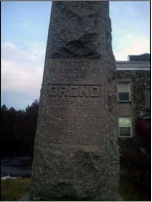 these monuments could be seen in town and on campus. we are on the land of indigenous people—we must honor its history and the people who were born here to care for it. the town of orono was named after chief joseph orono. other than the town sign— picturing a cartoon image of an indian in headdress – the gray, indistinct monument outside the senior housing complex -shown above- is the only marker recognizing the penobscot tribe in town. it’s a shame. orono is home to the state’s flagship university, located on marsh island. the penobscots leased marsh island to a white farmer. rather than honoring his lease, he claimed he owned the land and sold it to other whites – stealing the island from the tribe. the town and university owe its existence to indigenous people and their land – yet the university is continually trying to undermine wabanaki natives and take away their tuition waiver. the land carries the memories of the people who endured—and survived—genocide. whites tried to make it so that native peoples were wiped out—vanished. now there are only four out of over two-dozen tribes left in the wabanaki confederacy of maine and maritime indians—yet thankfully, indigenous people have survived the american holocaust—and in this moment, are rejuvenating their land, traditions and selves – cleaning the river, removing dams, organizing grassroots recycling programs, teaching children their native language, working on a truth and reconciliation program between the tribe and state to address the wrongs done to native people by the state child welfare system and bring healing.